Mr.SURFACER 1200 contains finer granules than Mr.SURFACER 1000. They are both used in much the same way. 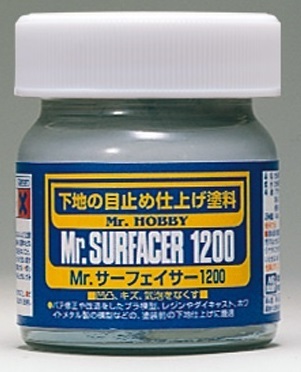 MR. SURFACER 1200 ES UN PUTTY LIQUIDO QUE TIENE PARTICULAS AUN MAS FINAS QUE EL SURFACER 1000, POR LO QUE EL ACABADO DE LA SUPERFICIE SARA AUN MÁS LISO. PUEDE UTILIZARSE TAMBIEN EN RANURAS FINAS. TAMBIEN SE USA COMO BASE PRIMER EN LOS MODELOS. CONTENIDO 40ml.